The second house in a horoscope is called house of wealth. This is eleventh house from the fourth house. This is a favorable placement for the fourth lord. When the fourth lord is placed in second house from the ascendant, native gets good education, movable and immovable assets. He leads a very comfortable life. Mother and maternal relations will be having cordial relationship with native. So, fourth lord in this place in a horoscope chart is considered good. If it has benefic aspect and strength native becomes land lord and gets residual income from these assets. The eighth house represents the sudden change, death, and defame. The fourth lord’s aspect on eighth house, gives good longevity to the native. Aries ascendant lord is Mars. The fourth lord Moon will be in Taurus. This is exaltationsign for Moon. Moon is friendly with the ascendant lord Mars. Moon produces very good results with respect to mother, education and assets. The native has good relationship with maternal relations. Waxing Moon is considered as a benefic in Vedic astrology. A benefic planet in the second house is very auspicious. It gives lots of assets and wealth to the native. 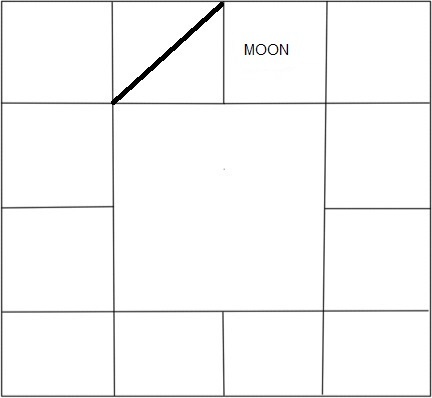 Moon’s aspect on eighth house gives good longevity. 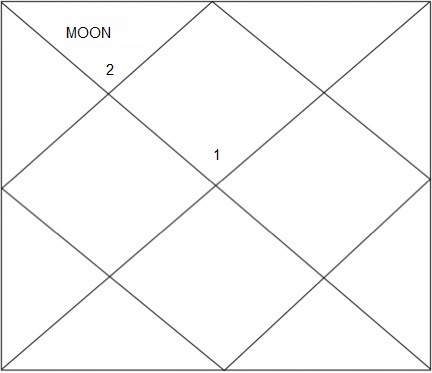 If Moon is placed in 2nd /4th quarter of Rohini nakshatra, better results are expected. Taurus ascendant lord is Venus. The fourth lord Sun will be in Gemini. This is neutral sign for Sun. Sun is enemy with the ascendant lord Venus. So, Sun doesn’t produce good results in this place with respect to mother, education and assets. The native may not have good relationship with maternal relations. Sun in the second place gives some eye problem to the native. He may have to wear spectacles at a very young age. If it has benefic aspect, it makes the native in a commanding or chief position. Gemini ascendant lord is Mercury. The fourth lord Mercury will be in Cancer. This is enemy sign for Mercury. So, Mercury performs fairly in this house. Native may have good relationship with mother or maternal relations. Mercury in second house shows that the native’s speech will be intelligent and smart. Mercury alone in a house or joined with a benefic planet is considered as a benefic planet. Mercury owns the ascendant also. So, this placement is very favorable to the native. Cancer ascendant lord is Moon. The fourth lord Venus will be in Leo. This is enemy sign for Venus. So, Venus performs fairly in this sign. Native may have ordinary house to stay. Venus is the pathakathipathi for this ascendant. So, pathakathipathi in second house brings financial problems to the native. Venus in second house makes the native’s speech very sweet. Venus’ aspect on eighth house gives good longevity to the native. If Venus is placed in 2nd quarter of Magha nakshatra or 3rdquarter of Phalguni/Puram nakshatra nakshatra, better results are expected. But if placed in2nd quarter of Phalguni/Puram nakshatra, good results will be reduced. Leo ascendant lord is Sun. The fourth lord Mars will be in Virgo. This is enemy sign to Mars. Mars is the Yoga-karaka to this ascendant. Yoga-karaka planet in the second is very auspicious. Native gets lots of immovable assets and gets residual income from them. Since Leo is a immovable sign, Mars becomes pathakathipathi also. Pathakathipathi in second house creates some financial problem. But since same planet is Yoga-karaka to this ascendant, native overcomes from these problems. The seventh aspect of Mars creates manglik dosh to the native. But some ancient texts say that Mars in Leo doesn’t produce manglik dosh. Since Mars is an aggressive planet and placed in house of speech, native will be short tempered and aggressive. Virgo ascendant lord is Mercury. The fourth lord Jupiter will be in Libra. This is enemy sign for Jupiter. Native may have ordinary house to stay. Virgo is a dual sign. The seventh lord is the pathakathipathi for this ascendant. Since Jupiter owns the seventh house and placed in second house, it creates financial crisis to the native. Jupiter’s aspect on sixth and eighth house gives good longevity to the native. Aspect on tenth house gives good growth in the profession. Libra ascendant lord is Venus. The fourth lord Saturn will be in Scorpio. This is enemy house to Saturn. Saturn is the Yoga-karaka planet for this ascendant. Yoga-karaka in second house is a beneficial one. It gives lots of movable and immovable assets to the native. Saturn in second house is generally considered not good, but since it is the Yoga-karaka, it is exempted for this ascendant. Since Saturn is a malefic planet and Yoga-karaka planet, native gets all these assets after very hard work. Saturn’s aspects on the fourth house gets lots of assets to the native. If Saturn is placed in 3rd quarter of Anuradha/Anusham nakshatra or 2nd/3rd quarter of Jyeshta/Kettai nakshatra, better results are expected. Scorpio ascendant lord is Mars. The fourth lord Saturn will be in Sagittarius. This is neutral house to Saturn. So, Saturn performs fairly in this house. Saturn in second house is generally considered not good. It makes the native poor, dull speech, depressed etc. Saturn’s aspects the fourth house may get some movable and immovable assets. Sagittarius ascendant lord is Jupiter. The fourth lord also Jupiter and will be in Capricorn. This is debilitation sign for Jupiter. This is not considered as a good placement for Jupiter. Native may have good relationship with mother or maternal relations. Jupiter in debilitation house shows that the native will have financial crisis and child birth delayed. Native may not get assets and vehicles. Jupiter is the most benefic planet in the zodiac system. Jupiter owns the ascendant also. So, this placement is not favorable to the native. If Jupiter is placed in 4th quarter of Uttara Ashada/Uththiradam or 4thquarter of Sravana/Thiruvonam nakshatra, better results are expected. But if placed in 2nd quarter of Uttara Ashada/Uththiradam nakshatra, good results will be reduced. Capricorn ascendant lord is Saturn. The fourth lord Mars will be in Aquarius. This is neutral sign for Mars. Mars performs fairly with respect to immovable assets. Native gets immovable assets and gets residual income from them. But since Capricorn is a movable sign, Mars becomes pathakathipathi also. Pathakathipathi in second house creates financial problem. The seventh aspect of Mars creates manglik dosh to the native. Since Mars is an aggressive planet and placed in second house, native will be short tempered and aggressive. If Mars is placed in 4th quarter of Dhanishta/Avittam nakshatra or 2ndquarter of Satabhisha/Sathayam nakshatra or 1st quarter of Purva Bhadrapada/Poorattathi nakshatra, better results are expected. Aquarius ascendant lord is Saturn. The fourth lord Venus will be in Pisces. This is exaltation sign to Venus. Venus is the Yoga-karaka to this ascendant. Yoga-karaka planet in the second house is very auspicious. This makes the native to have attractive speech. Native gets lots of immovable assets and gets residual income from them. Native owns luxurious houses and vehicles. Since Aquarius is an immovable sign, Venus becomes pathakathipathi too. Pathakathipathi in second house creates financial problem. But since same planet is Yoga-karaka to this ascendant, native overcomes from these problems. The seventh aspect of Venus gives good longevity to the native. Pisces ascendant lord is Jupiter. The fourth lord Mercury will be in Aries. This is neutral sign for Mercury. This is considered a fair placement for Mercury. Native may have good relationship with mother or maternal relations. Mercury in second house shows that the native’s speech will be intelligent and smart. Native gets assets and vehicles and leads a very comfortable life. Mercury alone in a house or joined with a benefic planet is considered as a benefic planet. Mercury owns the seventh also. Pisces is a dual planet. So, Mercury becomes pathakathipathi to this ascendant. Pathakathipathi in second hosue creates financial crisis to the native. Chapter 56 – Will You Become Rich After Marriage?